Revenue Performance Management: Viva La Drucker! RPM is a strategy to optimize interactions with buyers across the revenue cycle to accelerate predictable revenue growth. RPM is a strategy for managing a company’s interactions with buyers through the entire purchase process to enable dramatically more predictable, rapid and profitable revenue growth. Quite simply, RPM is empowering Marketing to transform its perception from that of a cost center to that of a partner revenue generator, alongside traditional Sales. As a business strategy, RPM requires the right mix of people, process and technology in order to drive real revenue growth. Marketing automation is certainly one enabling technology, but not the only. After all, businesses use all kinds of tools and services to drive revenue – from social media tracking tools to website analytics to sales force automation. But even more important than investing in technology is the development of business practices that are universally accepted and adhered to. Long-term forecasting to identify future revenue opportunities. Jon Miller, VP of Marketing at Marketo, offers an equally succinct take on RPM in a whiteboard session on video, “What is Revenue Performance Management?” The Marketing Id would encourage readers to view his entire five-and-half minute video pitch. I was intrigued by Jon’s reference to RPM as the equivalent of a six sigma process on the “demand chain side” corresponding to the more well-known six sigma process on the cost or supply chain side. He also mentioned a comparable need for achieving a mentality for continuous measurement and process improvements on the demand chain side. More importantly Jon, like his Eloqua counterparts, stressed on the imperative for transforming people, process and technologies to ensure the success of RPM. The concept of a Chief Revenue Officer that oversees both, CSO and CMO functions, across the new integrated sales and marketing funnel, is definitely a way to go. The need to review and revise how sales and marketing people are measured and compensated seems inherently fair. And, critically, to evaluate and incorporate the right technologies and tools, over and above a company’s CRM system, that would support the entire revenue cycle. Having reviewed what both these thought leaders in the marketing automation space had to say about RPM, The Marketing Id saw it fit to encapsulate their combined RPM vision in one diagram that is reproduced below. Per the old adage “a picture is worth a thousand words,” the diagram captures all the essential elements of an RPM system. The management guru was way ahead of his times–Peter Drucker never considered marketing as a cost to the enterprise! His vision is being born again as today’s RPM gives new meaning to the concept of a marketing-driven organization. Viva La Drucker! 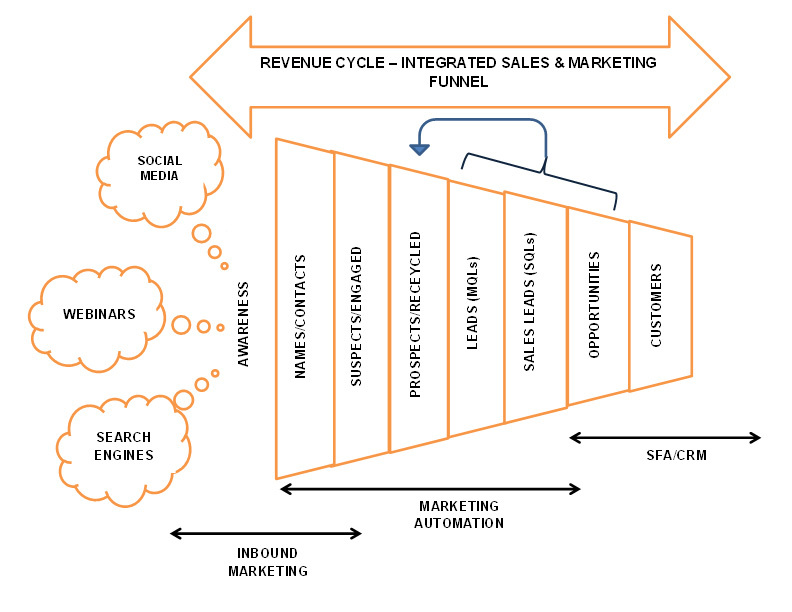 How Inbound Marketing Is Driving the B2B Marketing Mix–Viva La 4Ps!